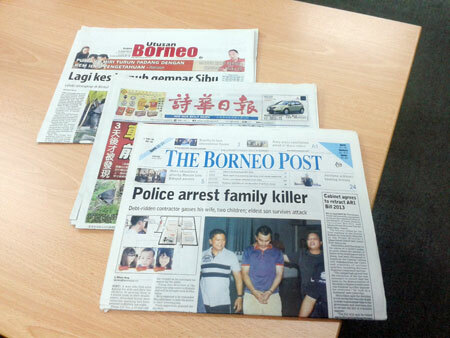 TOP IN SABAH AND SARAWAK: The Borneo Post and its sister papers See Hua Daily News and Utusan Borneo. The latest figures released by Audit Bureau of Circulation (ABC) which show The Borneo Post and our sister papers See Hua Daily News and Utusan Borneo topping the circulation charts in Sarawak and Sabah remind me of Oliver Cromwell’s warning on success. Nobody can argue against the wisdom of this maxim and history is replete with examples of nations, companies, organisations, teams and individuals who sat on their laurels for too long and found themselves overtaken by those behind them when they were at their peak. While my colleagues and I are entitled to a pat on the back and blow our own trumpets a little, which we did by publishing the news in the front page of The Borneo Post on Saturday, we should all take heed of Cromwell’s warning. As far as circulation is concerned we are more than the proverbial country mile ahead of our nearest rival but that does not mean there are no more mountains to climb. In fact, circulation rivalry is fast becoming obsolete as the threat to newspaper organisations does not come from other traditional publications but from the Internet. While I do not foresee the complete demise of newspapers, not in the foreseeable future at least, the encroachment of the cyber media into the print media market is inexorable. The media industry in Sarawak and Sabah is the edge of the ‘global media pond’, we are always among the last to feel the ripples of change emanating from the centre. We read about established reputable newspapers closing down or going digital to keep up with market demand but I was not aware of the pace the digital changes taking place in mass media until I attended a seminar on Culture Change in Digital Times in Singapore a few days ago. There I learned that barely a few years after elbowing newspapers to the edge of the market precipice news websites are now taking a dose of their own medicine as Twitter and Facebook are challenging their dominance in news dissemination in many countries. Truly as folk singer Bob Dylan sang in the sixties – The times they are a changing – they always have been and are picking up pace all the time. Getting better does not mean improving on your skills but more so it means acquiring new ones. In Malaysia, one of the best examples of becoming bad through not getting better is our national football team. Sports fans of my generation still revel in the glory years of the Malaysian soccer team in the 60s and 70s when the likes of Mokhtar Dahari, Soh Chin Aun, Santokh Singh, Shukor Salleh, Chow Chee Keong, Arumugam, James Wong, Hassan Sani and so many others don the national colours. Back then Malaysia was perhaps the most feared team in Asia – we regularly beat the likes of South Korea, Japan, Singapore and Thailand. Alas, as the years rolled, countries in our region caught up with Malaysia and some like Japan and South Korea are now streets ahead of us. I believe Malaysian football has not deteriorated since its 60s and 70s hey days, it just stopped getting better or it improved slower than other national teams. The depth Malaysian soccer has sunk was laid bare by Singapore’s LionsXII when the team comprising mostly under-23 Singaporean players won the Malaysian Super League. When what is essentially an under-23 team from Singapore could finish top of a league of the best teams in Malaysia, it is time to sit up and do something. Another classic example of the peril of ignoring Cromwell’s warning is the demise of the British motorcycle industry. Back in the fifties British brands like BSA, Norton and Triumph dominated the market – these bikes were heavy cumbersome machines but they were the best back then. Then they committed the classic blunder of not getting better – when the Japanese entered the market with their smaller, more efficient motorbikes the British manufacturers scoffed at the little machines. Theirs were the best and they saw no need to mend something that was not broken. As a result of its standing still, the British motorcycle industry was almost entirely eclipsed by the more fuel efficient, lighter and cheaper Japanese bikes. By the time they woke up to their folly they were too far behind their rivals. Cromwell’s words have rung true throughout history and despite numerous examples of the dire consequence of ignoring them many are still continuing to do so. We never learn from history – we repeat it.